Yellow and fuzzy, not my favourite! 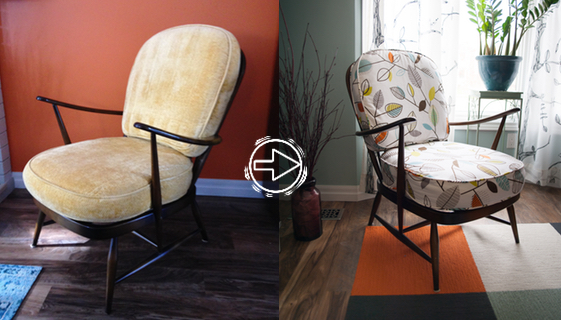 Though the fabric was still in excellent condition, the colour and texture were not my style and I knew this chair could be so much more! I decided I would take on the task of picking new fabric and sewing new covers. Now my sewing skills are probably better than the average person these days but these covers still required double cording which I had never done and of course zippers which I always find challenging! But step one was to decide on a new fabric. I set out to find a sea foam green or turquoise linen fabric and succeeded. I bought the fabric and it sat in my sewing room for about 6 months. In that time I was completing more and more assignments for my diploma program at The Interior Design Institute and one of those assignments required us to find fabrics to specify for upholstery and window coverings. In that research I came across this fabric and fell in love. So I bought some of this fabric and it sat in my sewing room for another couple of months. And then I decided that even though I knew I could sew those covers, I probably couldn't do them as perfectly as I would like and who knew when I would actually find the time and motivation to do them so back to Kijiji I went and this time I found Nicole at Nicole Flanagan Creations. She did an amazing job on these cushion covers and she also did them quickly and for an amazing price. Finding her has been such a great discovery and I know I hope to be working with her again in the near future. Check out the chair now. This chair is like brand new and my plans to refinish the wood to a natural, light finish have completely vanished. The wood that once looked too yellow and dated with the yellow covers, now look just the right kind of vintage.